These exquisite Parisian designer dresses born from the city of love are certain to capture your heart. Also regarded as the fashion capital of the world, it’s no wonder that Paris’s resident designers are responsible for many of today’s most celebrated fashion trends. Take a peek at our Parisian inspired edit to acquire these most adorable and coveted designs! These sumptuous silk creations are some of our absolute favourite Parisian designer dresses. From romantic floor-length gowns to adorable ruffled minis, there’s a dress for every occasion. The yellow silk georgette gown by Rochas is sure to temp you with its stunning silhouette and delicate floral print. 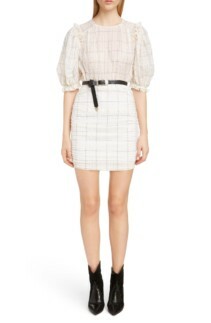 Ruffled cap sleeves and a pleated bodice shape the top which leads to a flatteringly defined waist. The sweeping, floor length skirt falls elegantly from here, incorporating pockets and ending in a wonderfully pretty gathered hemline. This dress makes a truly romantic and memorable statement. Many beautiful tiers of ruffled silk decorate the stunning Enta asymmetric red dress by Isabel Marant. We also adore the striking geometric print which truly gives this dress the wow factor. Meanwhile, the tiered skirt and asymmetric silhouette add playful touches in addition to the one ruffled shoulder strap. A defined waist ensures a flattering and shapely fit for the wearer. French fashion is famous not only for its originality in trends but also it’s eternally chic and utterly refined constructions. There’s a certain sense of elegant simplicity and nonchalance that emanates from Parisian catwalks and these dresses are an exemplary illustration. 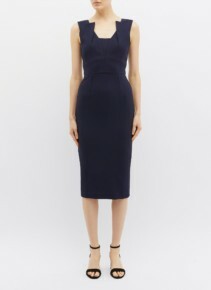 Take the ‘Coleby’ panelled navy crepe dress by Roland Mouret for example. This expertly constructed midi dress is the definition of polished design. From the designer’s recognisable origami bodice construction to the stylish slim fit, this dress is beautiful and wonderfully versatile. The mini black dress from See By Chloe is perfect for the current season. It too is versatile owing to its mostly black design and knitted wool blend fabric. It can be dressed up or down according to your engagements and slips on for convenient dressing. We also love how the neckline fastens in a decorative tie on the back of the dress enhancing the pretty ruffled metallic trim on the sleeves and hemline. 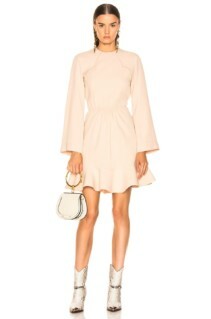 Wear this dress with heeled sandals for your next winter celebration.